I finally succumbed to temptation a few weeks ago and bought a Le Creuset griddle pan. One of my 'Life's Small Pleasures' is cookware that could kill a man. I have to use both hands to lift my pan. Le Creuset could probably take down Hulk Hogan and still make a mean bruschetta. I've been using it to cook fish, grapefruit, aubergine, sweetcorn and this salad. 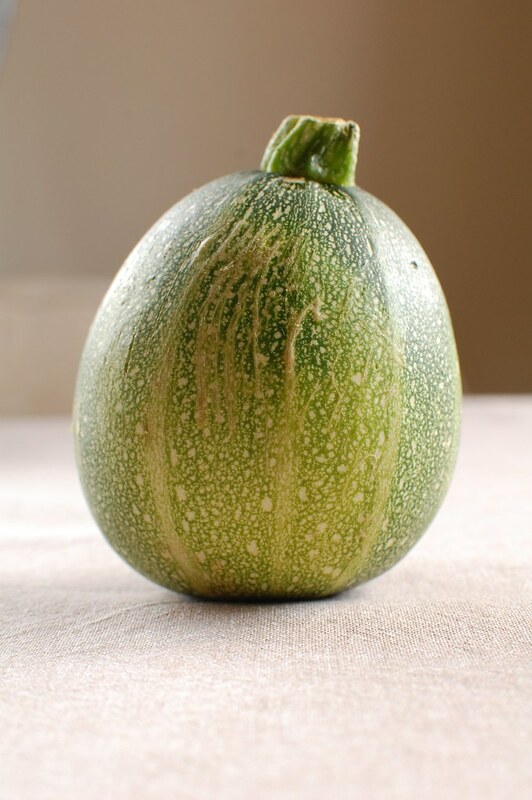 I picked up some round courgettes from the supermarket this week. They are more expensive than the regular courgettes you get in the shops, but they looked too cool to resist! I've had a couple of them stuffed with ricotta and breadcrumbs. They were good, but this salad, which I've tweaked and twiddled with over the years, is my favourite way to eat courgette. I've used Womersley fruit vinegar in this recipe. I bought some of their vinegars at the Real Food Festival earlier this year and I absolutely love them. You can purchase them on the Womersely website, which also lists stockists. But if you can't find these, you may find fruit vinegar in the gourmet section of Sainsbury's. Otherwise, use red wine vinegar. Start by using the mandolin to slice the courgettes into ribbons, about half a centimetre in thickness. Spread the rounds out into one or two layers on a plate and sprinkle with salt. Leave for 15 minutes to draw out the excess water. Whilst waiting for this to happen, heat the griddle or frying pan on the highest possible heat, until smoking. Add the pine nuts and, keeping them constantly moving in the pan, toast the nuts for 30-45 seconds. Keep a very close eye on these and have a plate ready to immediately transfer them onto, because they WILL burn if left in the pan for even a few seconds longer than needed. Return the pan to the heat and quickly fry the pancetta until crispy. Set to one side. Turn the heat down slightly so the pan is still hot, but not smoking. Scoop up handfuls of the courgette, squeeze the excess water out with your hands and roughly dry off with a clean tea towel. 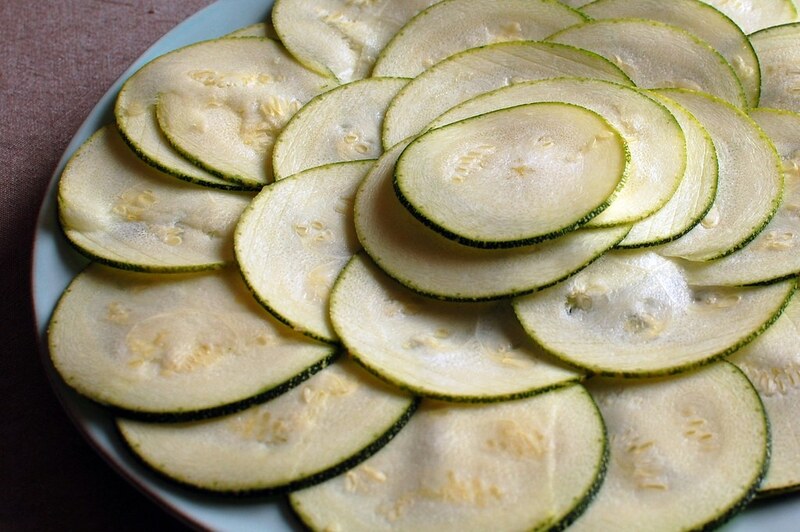 Add the courgette to the pan, one or two layers at a time and cook for 2-3 minutes on each side. Transfer to the plate which is already holding the pine nuts and pancetta. 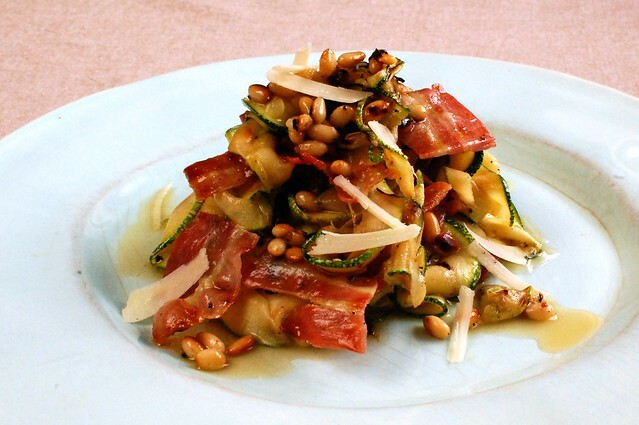 Allow the pancetta, courgette and pine nut mixture to cool slightly. While waiting, make the dressing. Put a pinch of salt and the vinegar into a bowl and allow the salt to dissolve (this will take a minute). Then add the oil, parmesan and pepper. Whisk the mixture until emulsified. When the pancetta has cooled enough to comfortably handle, snip it into bite-size pieces. Combine the dressing and ingredients, transfer to a serving plate. Stack it high, so you can plunge your fork through the layers and emerge with a good mix of everything. Finish with a little extra parmesan if desired. Serve with crusty bread. Any leftovers keep for five days or so in an airtight container. Try subbing the courgette with aubergine and the vinegar with balsamic.